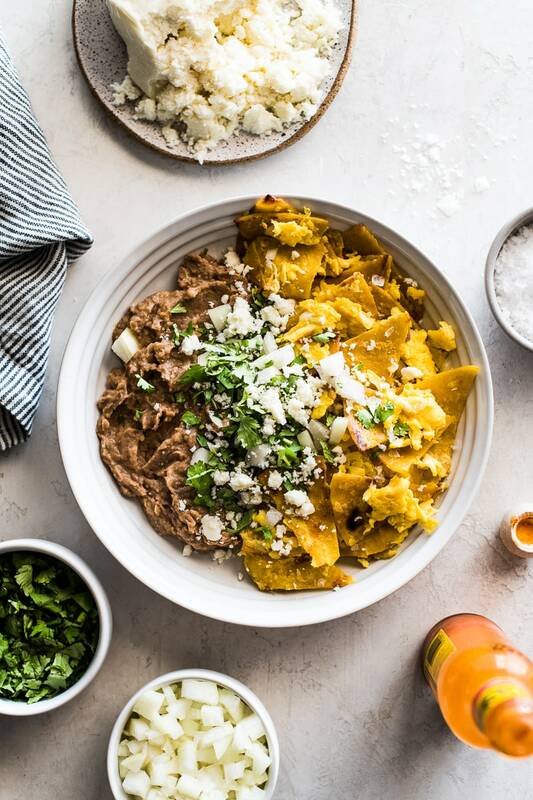 One of my favorite Mexican breakfasts is this Easy Migas Recipe! Made with crispy pan-fried corn tortillas and scrambled eggs, this easy morning meal is perfect for a big brunch and makes great leftovers. Corn tortillas are always in stock at my house. They’re so versatile and can be eaten with any meal of the day. 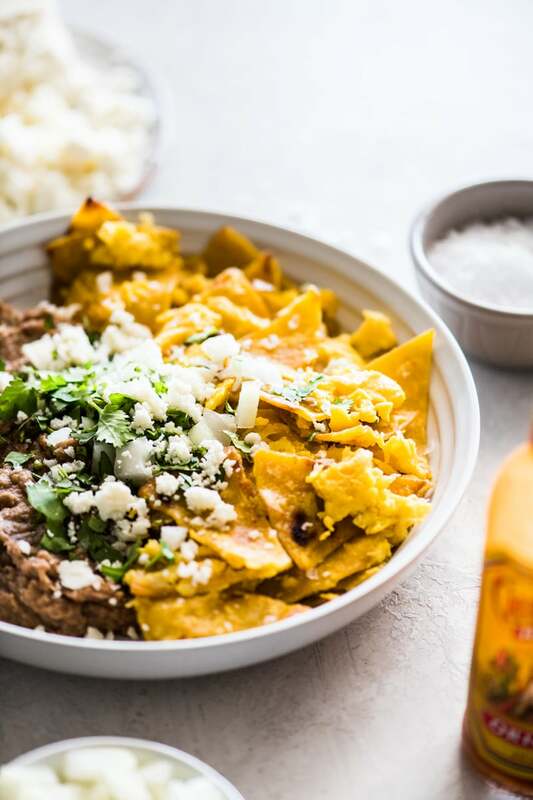 But though people can easily picture possible lunch and dinner options that incorporate corn tortillas, most find it a bit more difficult to find ways of eating them at breakfast time. Today, we’re going to fix that. If you’ve never eaten corn tortillas and eggs together, you are missing out. 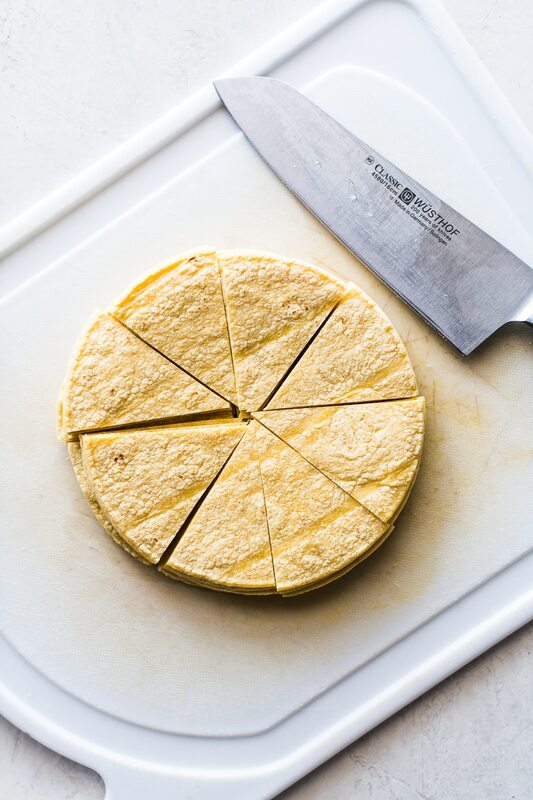 The nuttiness and corniness of the tortilla perfectly balances the richness and creaminess of the egg. Add some crunchy, fried texture and what’s not to love? While this dish is very easy to make, there is one thing you want to pay attention to when cooking this meal – the tortillas. One of the best things about migas is the texture provided by the crispy, fried tortillas. So make sure you fry them really well! 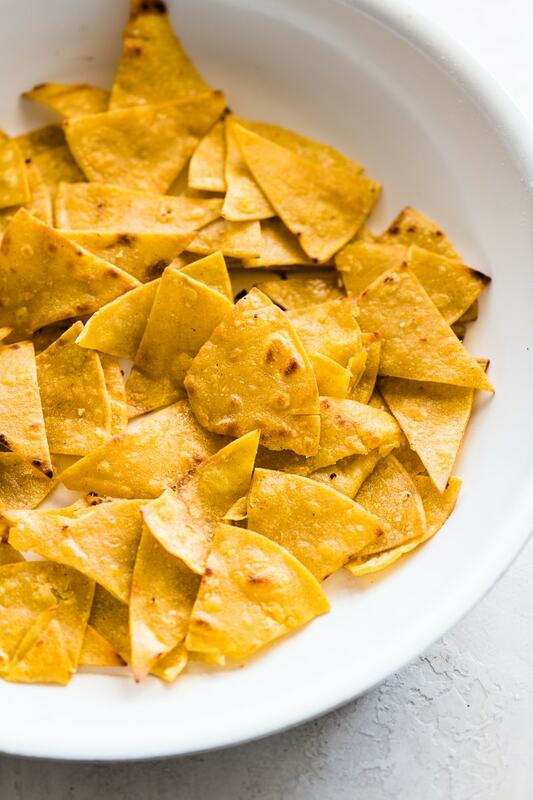 When you’re frying up the corn tortillas, be sure to get them as crispy as possible without burning them. They may seem too crispy at first, but remember that you are going to be adding eggs later. Once you add them, the tortillas will soak in some of the added moisture and soften up a bit. 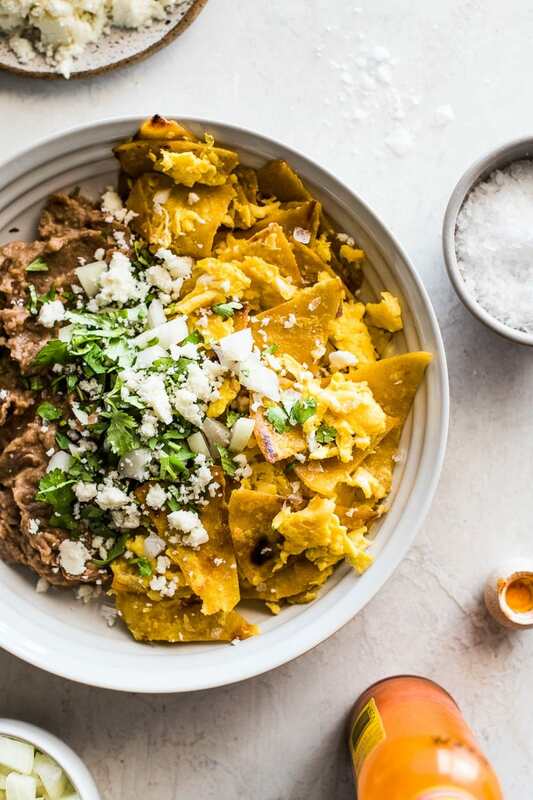 While migas are delicious eaten plain, I really love topping them with some diced onions, chopped cilantro and a crumbly cheese like queso fresco, cotija or feta. Serve them up with a side of homemade refried beans, a dash of your favorite hot sauce and breakfast is on the table in only 15 minutes! Heat olive oil in a large nonstick skillet over medium-high heat. While oil is heating up, whisk eggs in a medium bowl and set aside. Add the corn tortillas to the skillet and fry until crispy, about 6 to 8 minutes. Add whisked eggs, salt and fold them into the crispy tortillas. Cook for about 2 to 4 minutes, until the eggs are fully cooked and no longer runny. Remove from heat, taste and season with more salt to taste. Serve with chopped cilantro, diced tomatoes and queso fresco if desired. A month’s worth of gluten free on-the-go breakfast recipes to help make your morning breakfast routine a little easier. Success! Check your email to received your free ebook. I was browsing for a recipe to make with corn tortillas and I found this recipe. I remember that my aunties would make this for supper instead they always made it in a big cast iron pan because we were a big family of 6 kids. I really liked it so I’m going to make it for my family I’m hoping they will like it, like I did as a child. I’ve made this a few times, I love it, it is a new mainstay breakfast for me. I am usually cooking for one so I use 1/4 of the ingredients. I find it not filling enough as is so I add some protein, either taco spice seasoned ground beef or refried beans (fry either separately then throw em in before adding the eggs). So good! Made several times and love. I can’t believe I have never made this dish before. My mom used to make it all the time! It was so good, I loved the peppers, I served it with refried beans and flour tortillas. Can’t wait to make it again! This was a wonderful recipe! I made it for dinner and my husband just raved. I don’t fry anything because I don’t have a stove hood, so I used broken up corn tortilla chips. Worked like a charm! I also added a minced jalapeno and topped it with some Monterrey Jack cheese. Served it with sliced avocado and salsa. This is definitely going into my monthly recipe rotation! Thank you for sharing this! This recipe is definitely my families and friends favorite. As mentioned above in some responses, I have used jalapeños for heat, onions, and too add depth to the dish, a couple of cloves of garlic. It emphasizes the nuttiness of the corn. I like to top off with a light sprinkle of cheese, either cheddar or best of all, smoked gouda. It adds creaminess. As for the best store bought flour tortillas, I like Geurrero’s. It comes close to homemade and what my “abuelita” would have made. I made these this morning. Migas were one of my husbands favorite meals. Instead of bell peppers, I add jalepinos and definitely add the cumino!!! THE BEST!!!!! Also had mild red salsa on the side. YUMMY! Woo woo! I’m so happy you liked them! 🙂 Thanks, Linda. I cannot believe I found this in print! Years ago when hubby and I spent a year sailing our boat through mexico, from Ensenada to Huatulco, somewhere I ate this, and loving it so much, created my own version. I’ve cooked it for more than 2 decades! My criteria for making it requires only 3 things. Tortillas, eggs, peppers (I use fresh roasted pablanos). Everything else serves to increase the delicioso factor! Thank you!! Yay! It’s one of my fiance’s favorite breakfasts. There’s just something about crispy corn tortillas that makes it irresistible! This looks so good! I love your photos – so vibrant and clear. Can’t wait to check out more of your blog! Aww, let me know if you make it! I hope it’s as good as you remember it to be. Ummm heck YES! Anytime the hubby and I go to brunch, we both find something with a little Mexican flair to it. Too good!